Teaching preschool science well can show kids how science can be fun, gross, and spectacular. When you homeschool or decide to enrich your child’s education with at home lessons, the entire world and universe can be an inspiration for your child’s study of science. Today, The Jenny Evolution welcomes Theresa of Theresa’s Reviews as our guest blogger. When Theresa was finishing her Master of Education degree in Elementary Education at Vanderbilt University, her favorite class examined best educational practices for teaching science to children. 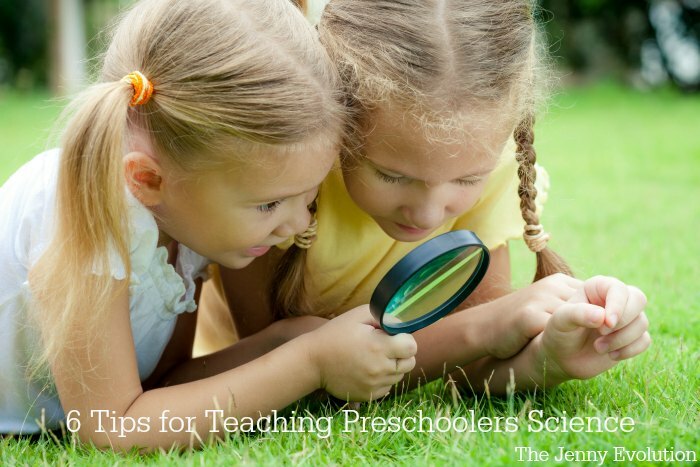 Teaching preschool science to your toddler can be about anything that you can observe in the natural world with your child. While planning lessons for your child, go with what your child loves most, instead of strictly using pre-made lessons found online or in a curriculum book, to improve your child’s engagement and motivation to learn science. If you plan to homeschool your child for preschool, check with local associations to find groups for your child to play with on a regular basis. According to HSLDA, group play can make learning enjoyable. When your child can discuss scientific observations with a buddy, studying science doesn’t seem mundane or like it’s work. Friendly conversation makes studying science exciting. Kids are naturally inclined to think about what they see around them. Get some kids together on a semi-regular basis with a goal of learning something new from nature. Form a homeschool group nature walk in a local park. Meet up at the local observatory to learn the basics of astronomy. Head to a zoo or a science center. To have a less-expensive get together, invite some kids over to your home to play with your science toys. If you have multiple children, your preschooler already has some regular playmates, but she could use more exposure to children her age. While exposing your child to science concepts, your child could learn social skills that are critical to their development. As you teach about the natural world, consider your child’s interests. My children love patterns. According to Playful Learning, examining patterns lays a foundation for studying mathematical concepts as you study science. Examine the design patterns that you spot in the natural world, such as colors and lines, on the leaves and in the sky. Record your observations in a notebook. 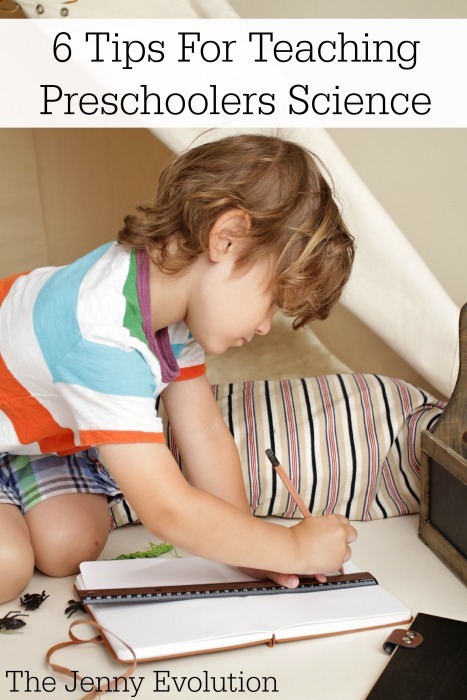 To help your child develop emergent literacy, give your child a notebook. Encourage invented spelling or a combination of pictures and written language, which you can write for your child as she dictates what she wants to say to you. Another fun pattern lesson would be to examine the pattern of the moon. When your child enters elementary school, most state standards encourage learning the moon phrases from kindergarten to fourth grade continually year after year. Your child can get a head start on learning the phases of the moon as you introduce the concept. Easily you can view the moon in the night sky, or purchase an inexpensive Moonscope to help. As you examine the pattern that the moon makes monthly, eat the shapes that the moon makes out of an Oreo cookie. Adding edible manipulatives to the homeschooling science classroom can make any child excited. Consider the academic language that you are teaching science. For instance, in a lesson about the moon, you might need to examine the following words with your preschooler: moon, phase, sky, night, waxing, and waning. Introduce each term with a definition and help make connections to things that you child already knows to activate prior knowledge. An older or more advanced child might consider harder terminology, such as the northern hemisphere and the southern hemisphere. You would need to teach with a world mat to explain that the shape of the moon’s phases is reversed in the southern hemisphere versus in the northern hemisphere. While teaching, you don’t have to teach every vocabulary word out there to get critical concepts across to your child. Narrow down your selection of academic language before you teach the lesson. Choose one or two main vocabulary terms that you will explain through a discovery lesson. During the lesson, you don’t need to use the new vocabulary term. Make meaning of the term first by using visuals and hands on activities. If you were teaching the lesson about the moon phases, you would examine the pattern of the moon before describing the words “waxing” and “waning.” After your child discovers the meaning of the concept you are teaching, you can name the concept using the new vocabulary word. While teaching science, allow your child to make the discovery. Good teachers let children work to obtain knowledge. Let your child teach you. Avoid telling information. Your child should be able to explain the facts, analyze concepts, and create projects with minimal help from you.In teaching, increasing the level of independence that kids show (scaffolding) is a key concept. Parents who want to teach their kids must learn to let the kids work independently. As you scaffold information for your kids, begin with realistic expectations and model the activity with explicit instructions. After you model your expectations, do the activity with your child. When you have given support and directions, your child should be ready to work independently. Double check that you do have your child show independence with the lesson. Skipping independent work can mean that a child never fully understands the concept. Children will learn what is expected of them, so hold them to high expectations. According to MWSU, with the inquiry approach, the 5 E Learning Cycle includes engagement, exploration, explanation, elaboration, and evaluation. Parents can familiarize themselves with the concept to teach better science lessons at home. Every lesson should begin with the engagement stage, which means that you can start with a hook, a quick, interesting moment, to catch your child’s attention. During the exploration stage, your child makes discoveries. After the exploration stage, you provide an explanation and elaborate on key concepts. As the lesson ends, evaluate what your child has learned, and encourage your child to assess her learning to make her more aware of how she is learning. While using the 5E Learning Cycle, consider which stage you are on when you develop questions to help your child learn. If your goal is to engage your child, your questions can focus on topics that interest her. As your child explores, encourage her to form a hypothesis and predict what might happen. During the explanation stage, avoid giving a lecture, which wouldn’t be age appropriate for a preschooler. Instead, provide meaningful feedback to explain specifically what your child is doing well and how she might improve in an area. Giving meaningful feedback is a good skill for parents to learn to encourage more learning in the future. great tips, pinning! Thanks for sharing at our FB Share Day! My sister’s oldest is going to be starting preschool this upcoming fall and she is a little nervous. Luckily, little Nate is one of the smartest kids I know and science already really intrigues him! I think her main concern will be the separation those first few days but I think that they both will get used to it. I know that Nate can’t wait to learn, especially about science! I think all parents and kids have some level of separation anxiety in the beginning. But after having two go off to preschool, I’ve learned they quickly adapt and enjoy the time. Thanks for sharing such interesting article! At this time I’m working as a writer in online service, and my wife in the seventh month of pregnancy, so we are interested in different things that related to parenting. I think that I have to teach my kid how to write short essays from the early age, I’ve read somewhere that it’s really helps to develop creativity and mind for kids. I think that if we start teach kids many interesting things like science, writing, reading, math, for them school would be really easy. Thank you again for this amazing article!